Children,have you ever worked on Internet? This is one of the advantages we enjoy while using the computer system, as we can do so many things while sitting at our home. We can get information on any topic, we can send mails, talk to others and so many other things. Let us see what is this Internet? The Internet has become an important toll in today’s world. It can be easily access form anywhere. Using this network of computers, information is shared in many different ways. You can exchange your information and ideas with millions of other people, connected on this network. The term Internet stands for Interconnected Networks. there are millions of computers connected around the world via telephone lines or wireless medium of communication. You can quickly send and receive messages anywhere in the world. You can do shopping on the Internet. The purchased things will be delivered to your home. You can get latest news of the world. You can talk to the others anywhere in the world, like you do on telephone. You can get information on any topic from the internet. World Wide Web is a collection of information stored in the form of interconnected web pages.These web pages are connected such that they form a web like structure over the internet.That’s why it is called World Wide Web. Moving from one page to another on World Wide Web is called Net Surfing. A website is a collection of web pages containing information related to a particular topic or organization, etc. Each website has a unique address which identifies it on the World Wide Web. The different pages of a website are linked with each other. We can move form one page to another by clicking on these links. It is a page on the World Wide Web which contains information in the form of text, graphics, audios and videos in it. It has links to other web pages. Do you have internet connection at your home? If yes, who is your ISP? Modem helps to send the information from your computer to other via communication lines. Modern stands for MOdulator DEModulator. It can be connected either internally or externally to your computer. The computer is connected to a modem and the modem is further connected to a communication line(telephone network).Data is transferred form one computer to another through these line. Internet connection is provided by Internet Service providers or ISPs. A web browser is a software which helps to access information on the Internet. A web browser displays web pages in its window. Examples of the most popular web browsers are Microsoft Internet Explorer, Apple Safari, Mozilla Firefox and Google Chrome, etc. Go to All programs and click on Internet Explorer. 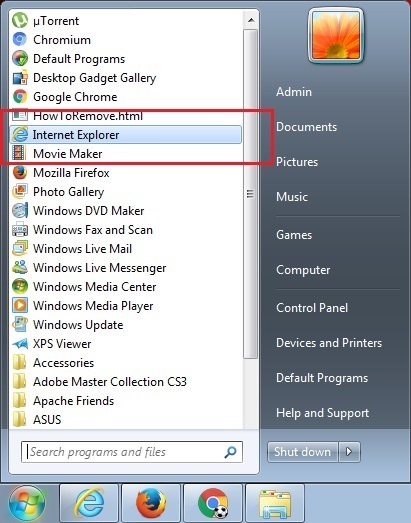 Open Internet Explorer by clicking this icon on the task bar. Type the address of your website in the Address box and press Enter key. The web page will appear in the window after sometime. Moving from one page to another or from one site to another on the World Wide Web using links on the page is called Net Surfing. When a website is opened in the web browser, the Home page of that website appears in the window. Home page is just like an index or starting page containing links to other pages of the same Website or to other Websites. When you bring the mouse pointer on these links, it turns to a hand to a shape arrow. 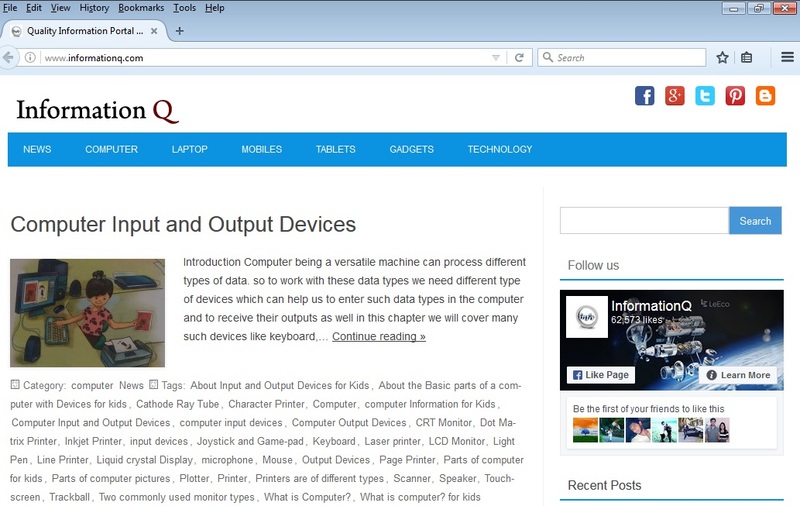 Clicking left mouse button on that link opens the connected page in the browser window. Cyber cafe is a place where we go to work on internet. Here we find a full setup of computers and internet connection for which we are charged money. Internet is the largest network of computers spread across the world. We can exchange information and ideas with millions of people around the world using Internet. World Wide Web is a collection of interconnected web pages. A Website is a collection of one or more related pages which are linked with each other. ISP is a company that provides internet facility to its customers. Modem is a hardware device which is used to connect communication line with the computer to send or receive the information. Open some useful websites for the children and explain them the terms like web page, website, site address, links, etc. Demonstrate them how the links are used to surf the net.